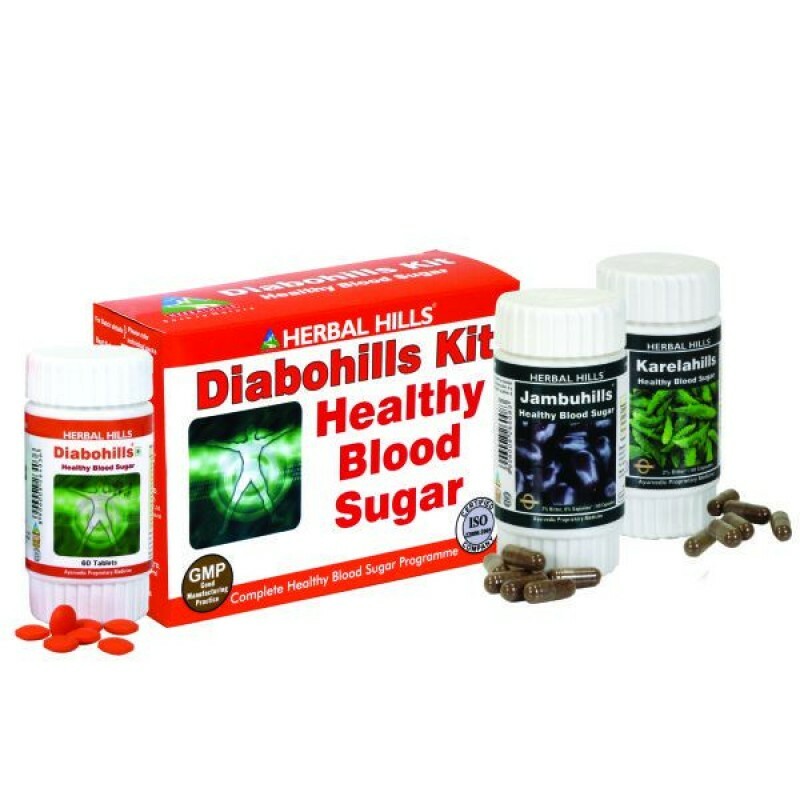 Healthy Blood Sugar Kit Contains 1) Diabohills 60 tablets 2) Jambuhills 60 capsules 3) Karelahills 60 capsulesMain ingredient Diabohills Formulation supported by Single herb Jambuhills + Single herb Karelahills to give Complete, effective & speedy result in Diabetes Management1) Diabohills 60 tablets Diabohills is a unique combination of herbs that help in managing blood sugar levels, Helps in maintaining blood sugar levels. - Jambu besides its anti-diabetic activity, also helps in alleviating symptoms of polyured & polypepsia. - Karela is traditionally used as a potent anti-diabetic herb. It helps in insulin sensitisation. - Amla & Guduchi being rich in nutrients, its rejuvenative property helpful in supporting protection against diabetic complications. Its antioxidant property helps in providing protection to key organs from free radicals - Gudmar - the name itself is symbolic of its activity. Several scientific papers are published to establish antidiabetic & insulin sensitizing property of Gudmar - Mamejawa is considered to have anti oxidant, Anti lipidemic and hypoglycemic properties.Benefits : - Helps in maintaining normal sugar levels - Helps in maintaining glucose metabolism - Supports normal lipid metabolism.2) Jambuhills 60 capsules Jambubeej is considered to have a natural property to reduce sugar level in blood & urine. It has a cohesive action. - Each capsule contains 175 mg Jambu seed Powder and 250 mg of extract (as dry extract) from Jambu seeds (Eugenia jambolana) (8:1) (equivalent to 2000 mg of Jambu seeds). When assayed these tablets contain Bitter NLT 2%, Saponin 6%. - In Ayurvedic literature Jamun seeds have been mentioned to be useful in Prameha - Diabetes Mellitus. This has been backed by modern scientific literatures & publications. Jamun has been found useful in improving the functions of the pancreas. Astringent property of Jamun helps to bring about Healthy Blood sugar control and also control excessive urination in Diabetes.Benefits : - Helpful in Diabetes Management by its Blood Sugar controlling effects. - Helps in proper functions of the Liver - Safe for Long term use along with modern medicines of Diabetes.3) Karelahills 60 capsules Karela is a traditional fruit considered to help maintaining healthy blood sugar level - Each capsule contains 200 mg Karela Powder and 250 mg of extract (as dry extract) from Karela Fruit (Momordica charantia) (10:1) (equivalent to 2500 mg of Karela fruit). When assayed these tablets contain Bitter NLT 2%. - Ayurveda describes Karela to be a bitter tonic to be useful in the management of Diabetes. It has also been backed by modern scientific research. Karela helps to improve the cellular functions of the pancreas. Additionally Karela is also beneficial in controlling blood lipid (Cholesterol levels)Benefits : - Helps maintain normal Blood and Urine Sugar levels - Helps to regulate carbohydrate metabolism - Acts as a Bitter tonic - which helps to purify blood.